You could make an argument that the color of this record is actually orange, not pink. Or maybe you could get fancy and say it's grapefruit colored, but something tells me Joey Rubbish is not the sort of guy sitting around on Sunday morning eating grapefruit. Rather he strikes me as the kind of guy that on Sunday morning still hasn't stopped partying from Saturday night yet. Is party garage a genre yet? Because that's the vibe I get from The Rubs album. Purveyors of a boozy good time at your favorite local dive bar. It has got the hooks and it has got the songs, but rather than deliver you a clean little pop nugget, each song is wrapped in fuzzed-out static and the sound of every needle in the recording studio being buried in the red. 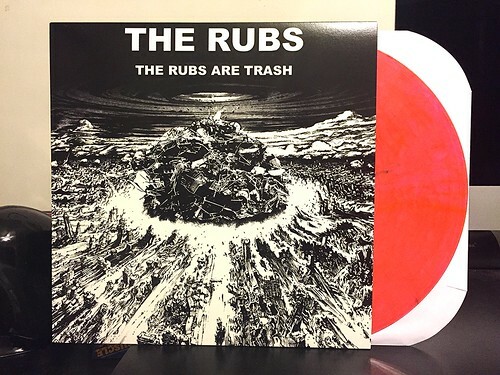 At its most frantic The Rubs Are Trash reminds me a bit of the first Yolks record, but it also brings in the sounds of some early 60's trash-rock bands. The Rubs have crafted a record that is both laid back and at the same time deceptively urgent. You'll want to jump around screaming at the top of your lungs, but you'll also keep listening to it on the way to the Sunday brunch you're heading to after Saturday night's debauchery.